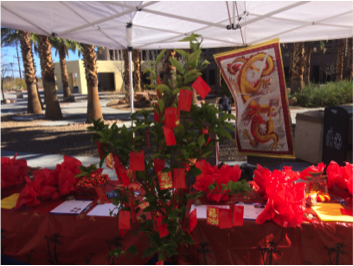 The Asian American Pacific Islander Heritage Committee hosted a Citrus Fruiting Event last month in celebration of the Monkey for Chinese New Year. More than 65 participants stopped by and received a tangerine, which is said to bring wealth and luck. Welcome back! I hope you took a few days during spring break to unwind and prepare for the whirlwind that lies ahead. April and May are tsunami months, full of activities and the winding down of the academic year. This Chronicle is full of updates to help you stay informed and abreast of many important happenings at CSN. I trust by now you have seen our new web site. This dynamic and engaging site is designed for students and prospective students and their families. The content has been streamlined and refreshed to help them easily access the latest and most useful information. It is a work in progress and if you have questions, please email webservices@csn.edu for further assistance. If you’re familiar with the old site and know what you’re looking for, you can still find it at http://archive.csn.edu/ for now. Or you can access the old site by going to the ‘Login’ link on the top right corner of the new site. This will take you to a dashboard with links to the old site, Canvas, and other frequently used pages. Please know that we are migrating important employee information to an intranet portal that will go live after the spring semester. The portal will include single sign on capabilities to all frequently used programs, internal forms, policies, and procedures. Our website is our electronic gateway and one of the most important recruitment and retention tools we have. It’s important that it be geared to students. We are all looking forward the activation of the portal, which in addition to allowing us to clean up our website will help us improve internal communications. At the April 22 special Board of Regents meeting, the Board will discuss different management structures for CSN. This is a topic I brought up at the January town hall with faculty and staff as to whether CSN’s size might be better suited to a different model. I will propose the formation of a study committee to the Board of Regents, comprised of representatives from CSN’s faculty and staff and its Institutional Advisory Council, to examine the capacity and structure of the college and identify opportunities to more effectively serve our diverse community and broad service area. 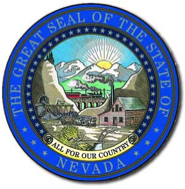 This is different from initiatives underway to place the state’s four community colleges under the control of a community college governing body, outside of the Nevada System of Higher Education. On the latter, I authored to following column, which was published March 13 in the Las Vegas Sun. The Governor indicated earlier this month that he will ask for plans for a 5 percent budget reduction from state entities. We’re not sure yet of the specifics of this for Nevada’s colleges. Earlier this month, the Board of Regents met and discussed potential legislative priorities for the 2017 session. The Chancellor and his staff put forth priorities from each of the college and university presidents for their consideration. CSN is represented in these discussions and supports, particularly, the compensation, formula, WINN, and SSOG adjustments. Increase capacity system wide: This initiative seeks to create additional capacity through new programs and initiatives. CSN’s projects related to capacity, the bullet above, include three pilot projects that can be supported with one-time money: College Readiness, a joint CCSD and CSN effort of intense programming for up to 300 students; Adult Learning, a financial aid grant for up to 100 adult students returning to college; and Prison Education, a pilot education program for up to 100 clients with a goal of reducing recidivism. Finally, CSN is proposing a redesign of Workforce education that, over a six-year period, will dramatically increase capacity for workforce training. The Board of Regents Handbook provides for employee bargaining units within NSHE. The American Association of University Professors/Nevada Faculty Alliance (NFA) applied recently to the Board for an election to determine if CSN’s academic faculty (instructing, library and counseling faculty) want the NFA as their collective bargaining agent. At its March meeting, the Board approved the holding of the election. The election is being conducted by the American Arbitration Association, and balloting is currently underway. Information about the process is delineated in the Board’s Hanbook Title 4, Chapter 4. I urge the thoughtful participation of those impacted in this process. We continue to work with SECTA to create an advanced manufacturing program at their campus for joint use. These students will receive advanced training in robotics maintenance and troubleshooting. This facility is part of our recently submitted proposal for the Workforce Innovations for the New Nevada (WINN) Fund. We know robotics are a critical component of manufacturing and the nation’s economy and we aspire to franchise this program in the southwest and northeast quadrants of the valley. The Clark County School District Board and CSN are working to expand the CSN High School program by 25 percent and to explore the joint use of resources to create a shared facility for a STEM-focused CSN High School program at our anticipated Northwest Campus. CCSD and CSN are also partnering to initiate a joint venture called the Catalyst Program, which will serve at first approximately 50 under-prepared high school students heading into their senior year to help them with college readiness. This will include assistance with navigating the college enrollment process, bridge programming and mentorships. As many of you know, we are pursuing National Alliance of Concurrent Enrollment Programs (NACEP) accreditation to ensure we maintain the highest standards in our concurrent enrollment programs on high school campuses. Once we receive this accreditation (and it is a rigorous process that we expect to wrap up in spring 2017), we hope to expand concurrent enrollment programs. These programs help schools improve their ratings and can have a significant impact on college readiness and college-going rates. 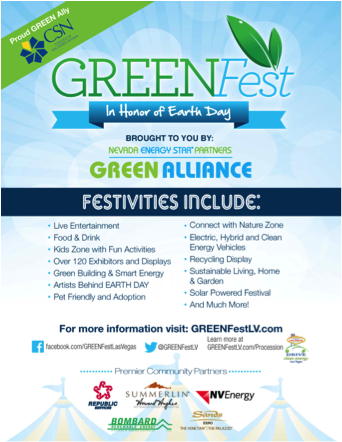 CSN is a proud ally in this year’s Seventh Annual Green Fest event, to be held on April 23 in honor of Earth Day. The event, which will be held in Downtown Summerlin, is the largest Earth Day festival in Nevada. Its aim is to promote recycling and a sustainable environmental lifestyle to the community. CSN will have a booth at the festival to promote the green education and environmental programs we offer. Anyone interested in participating can contact Environmental Strategies Committee Chair Steve Soltz. CSN and UNLV as well as CSN and NSC have finalized an MOU to create a Guaranteed Transfer Program for students who applied and were denied admission to UNLV. Upon acceptance to CSN, these students would be co-admitted to UNLV or NSC and CSN. Once students comply with the following requirements, they will be able to seamlessly continue their education at UNLV without needing to reapply. Also, CSN and NSC have entered into an agreement this month to develop joint academic and student support programs. 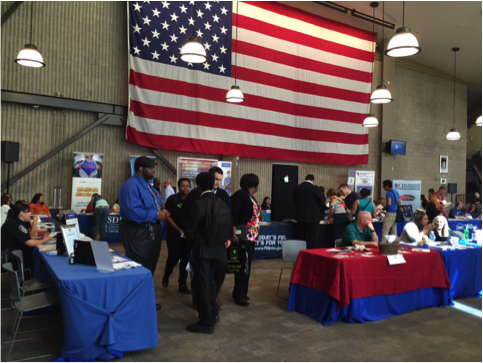 Thank you to all who helped foster the successful March 2 Career Fair, held on the Cheyenne campus, which saw more than 400 job seekers on hand to meet with 51 employers, including 15 companies participating for the first time. Several employers commented on the high turnout and the quality of the students attending the event. Many of the employers were interviewing on the spot and there were even some job offers made. The next Career Fair will be held April 6 on the Charleston campus. Exciting news from our Veterinary Technology program. Using Perkins funding, they were able to acquire a Computed Tomography device, also known as a CT scanner. It is one of only two in Nevada, and the only one in Southern Nevada. The special X-ray machine can be used to diagnose complicated problems in animals referred to the program’s fully functional veterinary clinic for treatment. It is time to submit your nominations for this year’s Excellence and Distinguished Awards, which honor CSN faculty and staff for outstanding work over the previous academic year. For more information, visit www.csn.edu/recognition or contact Internal Recognition Committee Chair Michele Fogg at michele.fogg@csn.edu. The deadline for submission is 5 p.m. Friday, April 15. CSN instituted a new “Reverse Transfer” degree process this month, and the response has been wonderful. Approximately 200 former students have contacted us to inquire about whether they qualify. Under the arrangement, students who have earned 15 or more credits at an NSHE community college and transferred to a four-year NSHE institution where they earned 60 or more credits may be eligible to obtain an associate degree for already completed coursework. It is a valuable program that allows students to obtain a degree they have already earned, which can help them gain employment and give them a boost as they work toward bachelor’s degrees. 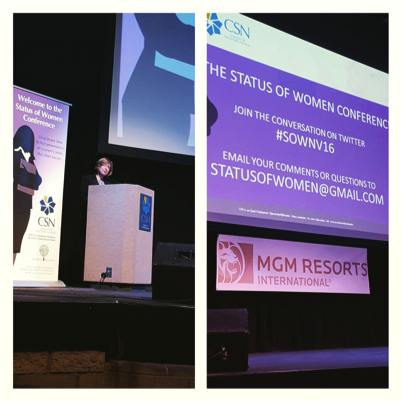 Barbara Buckley, executive director of Legal Aid of Nevada, was the keynote at the NSHE Status of Women Conference held at the Horn Theatre. As you know, March is Women’s History Month. I would like to thank the CSN Women’s Alliance for the many terrific and inspiring events this committee put on, including the NSHE Status of Women Conference on March 8 and empowerment fairs to promote student success and completion. These dynamic events are a lot of work and highlight the challenges many women face daily. Thank you for all you do. In case you missed our email announcement, congratulations are due to the following hardworking CSN faculty for whom the Board of Regents approved tenure this month. This is a major milestone and achievement! Whenever we can, we ensure the CSN and CCSD spring breaks align. But we also follow guidance from the Faculty Senate to have spring break before a specific number of weeks elapse in spring semester. This year the alignment could not happen to meet the Senate’s criteria. By the way, that criteria is important or we end up with spring break very late in the semester. 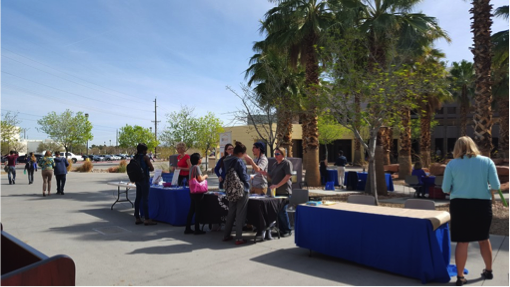 For Women’s History Month, the CSN Women’s Alliance facilitated Empowerment Fairs to highlight student success services at CSN. Returning students can register for summer, starting April 4 and new students on April 21. For fall 2016 registration, returning students can begin to enroll on May 2 and new students on May 20. This entry was posted in Budget News, Monthly Chronicles and tagged awards, budget, career fair, CCSD, chronicle, collective bargaining, governance, green fest, Legislature, reverse transfer, secta, tenure, website, winn. Bookmark the permalink.